Elijah, Op. 70 (Oratorio). Composed by Felix Bartholdy Mendelssohn (1809-1847). Arranged by R. Larry Todd. For Choral, Chorus, Orchestra (Study Score). Eulenburg Taschenpartituren (Pocket Scores). Study Score. 472 pages. Eulenburg Edition #ETP989. Published by Eulenburg Edition (HL.49010429).ISBN 3795761352. 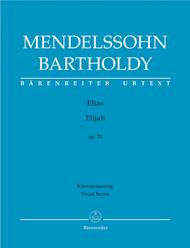 5.25x7.5 inches.Mendelssohn's oratorio “Elijah” numbers among the most important choral works of the 19th Century and should feature in anyone's collection of sheet music. With the new critical edition prepared in collaboration with Carus publishers, this work is now also available as a first-class edition in the Eulenburg pocket score series. Appropriate orchestral parts can be obtained from Carus publishers. Elijah, Op. 70 (Oratorio). Composed by Felix Bartholdy Mendelssohn (1809-1847). Edited by Douglass Seaton. Arranged by Andreas Kohs. For 2 soprano voice solos, 2 alto voice solos, 2 tenor voice solos, 2 bass voice solos, double SATB choir, orchestra. This edition: Paperback, Urtext edition. Paperback. Oratorio. Level 4. Piano reduction. Language: German/English. Opus 70. 311 pages. Duration 2 hours, 10 minutes. 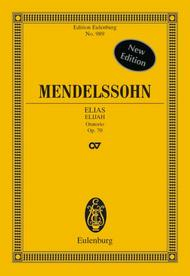 Published by Baerenreiter Verlag (BA.BA9070-90).ISBN 9790006527571. With Language: German/English. Oratorio. 27 x 19 cm inches.